This recipe can be adjusted to include any vegetables you want, like red pepper, kale or leeks, for example. You can easily substitute the oil, eggs and cheese with vegan alternatives, such as tofu for the eggs, to make the recipe enjoyable for any diet or lifestyle. Dice the onion and mushrooms. Slice the zucchini, tomato and avocado. Shred the cheese. Rub a generous amount of butter up the sides of your pan. Place on a medium-low heat and let the rest of the butter melt so the entire bottom of the pan is covered in grease. 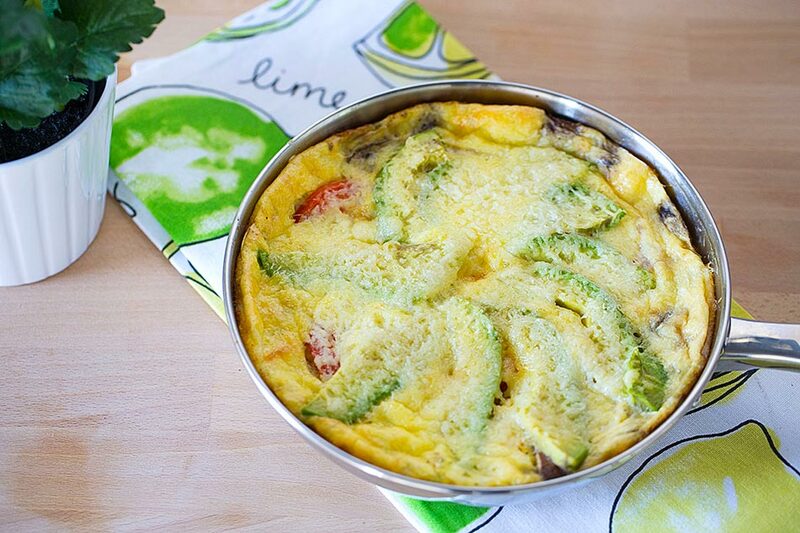 This will make it easy to remove the frittata when done. Add the onion, mushrooms and zucchini to the pan and sauté for about 2 minutes. Meanwhile, in a bowl, mix the eggs and milk together with a whisk. Pour the egg mixture on top of the veggies in the pan. Lay the slices of tomato evenly into the egg mixture. Allow the egg mixture to cook until it is only liquid along the top and center—about 8 minutes. Note: Keep your heat low so as not to burn the bottom of your frittata. Lay the slices of avocado across the top in a pinwheel shape. Sprinkle the shredded cheese evenly over the mixture and avocado. Remove pan from the stovetop and transfer into the preheated oven. Bake for about 10 minutes or until the cheese has melted and is slightly brown on top. You can also check to ensure the mixture is fully cooked in the center by inserting a butter knife: if it comes out clean, it’s cooked; if milky egg mixture is on the knife, it is not yet done. When done, remove from oven and allow to cool. You can serve it directly from the pan or transfer to a plate where pieces can be sliced and enjoyed! You will need a small oven-safe frying pan.